The reconstruction of a 2,000-square-foot stretch of orad is on schedule to begin in April and be completed in October 2018, with drainage pipes to be installed next month. HALLOWELL — Maine Department of Transportation Project Manager Ernie Martin on Wednesday provided an update to the Hallowell Highway Committee on the upcoming Water Street reconstruction project, which will include the installation of drainage pipes set to begin next month. The transportation department will be installing the two pipes — on Wharf Street and by the boat launch — starting Oct. 16 with work expected to be completed by Dec. 18. Martin said the only complication will be limiting access from Wharf Street to the boat launch to just local traffic. As far as the rest of the project timeline, Martin said nothing has really changed since his last meeting in Hallowell in April. The state plans to begin reconstructing an approximately 2,000-square-foot stretch of the busy corridor — part of U.S. Route 201 — in April. Martin said the hope is that the work will be completed at the end of October. Surface paving will be completed over four days in spring of 2019, and the entire project will be finished June 6 of that year. 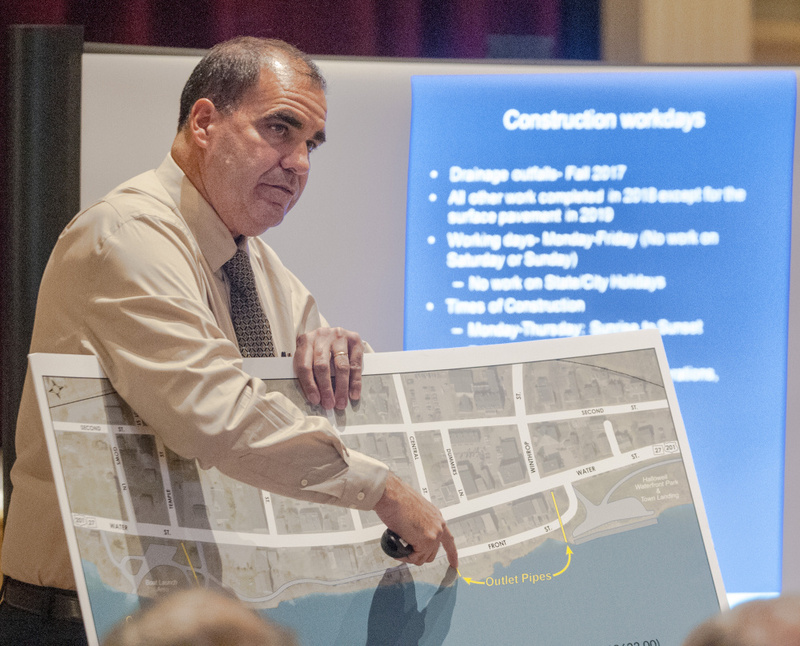 As he did in April, Martin confirmed that the plan calls for work on the east side of Water Street to start April 9 and last about 12 weeks; work on the west side of the street is set for July 16 to Sept. 14. 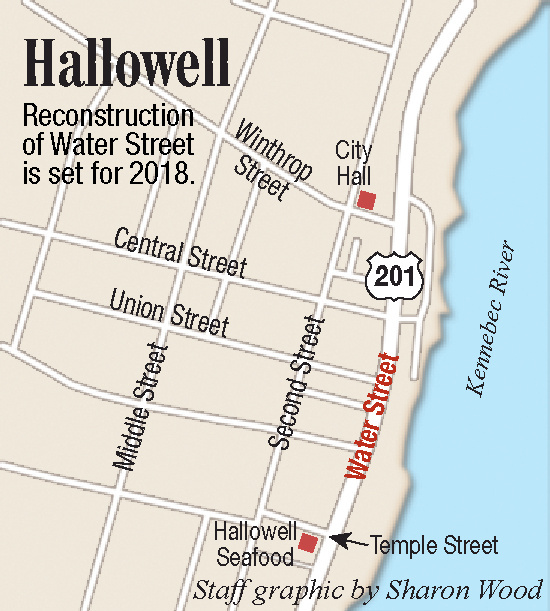 He said contractors will work on side streets in between working on Water Street, and there will be no work or detour during Old Hallowell Day on July 21. Martin said the transportation department has discussed offering a construction incentive to the winning contractor, but a decision hasn’t been made. The DOT offers money, sometimes $10,000 per day, to contractors finishing work ahead of schedule. “It’s been a consistent request at every forum for two years, so this isn’t new,” said Councilor Lisa Harvey-McPherson, the chairwoman of the highway committee. The Water Street project is estimated to cost nearly $5 million and will reduce the crown in the road, something the city had been hoping would happen for decades. In April, Hallowell voters approved a $2.36 million bond package that included $600,000 toward the Water Street reconstruction. Last week, Hallowell broke ground on a new fire station on the Stevens Commons campus Mayor Mark Walker said would be finished before the reconstruction of Water Street begins. The detour during the reconstruction will re-route drivers past Hallowell’s current fire station on Second Street. If the new station isn’t finished, the increased traffic on Second Street could be a problem when fire trucks are trying to leave the station. Since the project was announced several years ago, Hallowell businesses have expressed concern about what impact the road work will have on their business and whether they’ll see a significant drop in customers. Three Hallowell groups — the Down With the Crown and Hallowell Arts and Cultural committees and the Hallowell Board of Trade — have been meeting since earlier this year to brainstorm and come up with ideas to continue to make downtown Hallowell an attractive destination during the six-month construction period, which includes Hallowell’s busy summer season. Martin said the transportation department will do their best to minimize the impact, but he said there is always uncertainty for businesses with any construction project. There will be some time during the construction period where individual businesses will be inaccessible, but Martin said it would only be for a few hours. When the sidewalks on each side of the street are torn up and temporarily paved, there will also be an 8-foot-tall chain link fence with green mesh to protect people from the construction. Martin said there may be LED rope lights atop the fence to illuminate the sidewalk, and he said artwork can be hung from the fence. Communication is always the key with these types of projects, Martin said. 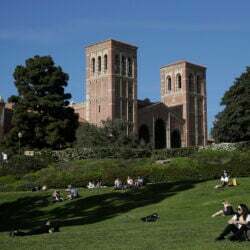 He will act as a liaison, along with City Manager Nate Rudy, and will facilitate conversations between residents, business owners and contractors. There will be information posted on the department’s website and Facebook page, there will be email alerts, newspaper ads and weekly contractor updates. The department will also utilize the Hallowell Board of Trade’s communication network. Martin said he plans to hold another meeting in Hallowell in December to go over the final plans for the project before the work is put out to bid in late January.